Watch any of the below Morse Metal Devil Videos to see how easily the Morse Metal Devil saw blade cuts through different types of metals. When clicking a below metal type link, a 2-5 MB mpg video file will be downloaded to your computer which should start once the file is downloaded. For high speed Internet users, this should only takes 10-20 seconds. If you don't have the FREE video RealPlayer, download it at www.real.com. 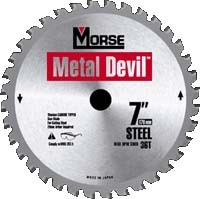 We sell the most heavy duty circular saw machines on Earth to turn the Metal Devil Saw Blades. With our machines, the blades STAY SHARP 3 TIMES LONGER than on standard circular saw machines. Videos Of Saw Blades Cutting Various Materials - These MPG VIDEOS are on our server, so you'll need software to play mpg files on your PC or smart cell phone to view them. We specialize in sharpening general to professional saw blades & router bits, manufacturing custom router bits, and selling new blind cutting saw blades, router bits, woodworking tools, & metal cutting circular saws.